FirstFleet, Inc. is dedicated to exceeding the expectations of those we interact with. This goal is more than a catch phrase - it is a way of life that requires every team member working in the same direction with a unified focus. To support this mission we have a set of COMMON VALUES that are core to our philosophy of life & work. We will not get it right every time, but we will strive every day to support and embrace these values. The CORE VALUES of FirstFleet are the guidelines by which we seek to conduct ourselves every day. Our mission first and foremost is to WOW our partners with service and dedication that goes beyond their expectations. We are committed to accomplishing this mission with the highest of regard for safety in every way. Empower our people to do the right thing. Every associate is expected to use their best judgement and always strive to do what is right for the customer, their fellow team members and for FirstFleet. Relationships will be built on trust. Trust is essential to progress, and we will seek to act in ways that strengthen the levels of trust between all involved. Value, care for and respect everyone. People are the lifeline of our business and it is essential that we treat everyone with respect and care. Embrace change as a reality of progress. Change is a consistently present and strong element of life. We will seek to embrace and leverage the power of change in our daily interactions. In 1986 Gary & Mary Beth Wilson started FirstFleet based on the ideas of delivering industry leading service to our partners and treating people like family. Thirty years later the company has grown in every way possible with over 3,200 employees encompassing over 70 cities. Staying true to course has not always been easy, but we have successfully remained true to the basic ideas we originated with - take care of your customers and your people. In this interview Executive Vice President Daniel Piper talks with Gary about the history of FirstFleet and the type of company we want to be known for. 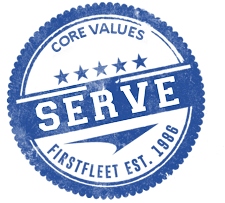 If you have questions or comments regarding the core values of FirstFleet please do not hesitate to reach out to us. You may have an experience or situation you want to share with us where a FirstFleet team member went above and beyond the call of duty - we would love to hear about it. Your feedback, comments, concerns & praise are all welcome at any time. You can reach us using any of the methods listed on our contact page. Founded in 1986, FirstFleet has consistently provided the highest quality Dedicated Contract Carriage service to business partners across the country. 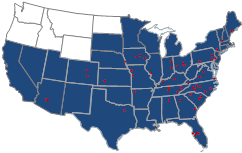 Currently operating over 2,600 company owned power units and 8,000 company owned trailers, we have operations based all over the United State with service to all 48 contiguous states, Canada and Mexico. We operate new, premium equipment, employ only the finest drivers with proven experience, and provide a full suite of technology offerings that add value to our services. We recognize that no partnerships are alike and we offer a flexible set of solutions customizable to meet the unique objectives of your business needs. What really sets FirstFleet apart is our commitment to provide the highest level of service and satisfaction to our clients by operating in a partnership that creates value for everyone involved. As a testament to the quality of our service, we are honored to say that we have existing relationships with clients that were established when we first opened our doors. The longevity of these relationships speaks volumes about who we are and what we are about. We believe in technology that returns productivity and efficiency to the operation and we have made strategic investments in everything from our back office systems to the equipment moving freight that allow us to be agile in our offerings. Mobile AwareWe are regularly refining a custom set of tools delivered on the Apple and Android platforms which are designed to add efficiency to your interactions with FirstFleet. Our mobile app allows for our drivers and business partners to stay informed and connected with ease. The flexibility of the platform allows for partner specific configuration of the application to be deployed with an aggressive pace and tightly tailored solutions. What can we build for you? Integration PointsIn regards to business-to-business integration, our aim is to provide the most reliable and flexible suite of technologies on the market today. With regard to file format we support all forms of B2B integration from traditional X12 EDI to custom XML and flat file formats. With regard to transport we support most any transport technology from simple HTTP(s) and FTP(s) to MQ and AS2. Essentially, you let us know how you need the data and we will provide the data in that format. Equipment TrackingWe have deployed satellite equipment tracking on power units and trailers around the country as well as on many of our reefer trailers. We use the data provided by this investment to deliver real-time notices to you in a variety of formats (B2B, load tracking, etc.) and to provide operational feedback for performance and safety compliance in real-time. Custom Reporting & Document ImagingWe can provide reports and tools that are custom-designed specifically for you and your business quickly. We strive to think critically with you, providing views into information - not just data-dumps. In addition, our document imaging system is fast and flexible, which means you have quick access to the documents that support the data at your fingertips. We can provide reports that are delivered to you on a schedule or that you can access at will. Safety is built in to our culture. We are proud to employ and recognize individuals who demonstrate safe driving and working habits through a series of incentive programs. We currently have over 500 drivers who belong to an elite group of professionals who have driven at least one million miles without a preventable accident and we are adding to that number on a regular basis. These drivers have demonstrated the kind of dedication to safety that FirstFleet is known for, and they are rewarded for it. Late Model EquipmentBy utilizing the latest advances in transportation technology we provide are able to invest in safer environments for our drivers and those we share the road with. Each new year of equipment brings with it new mechanisms to ensure we operate with safety as a top priority. Mobile Device TrackingProviding tools to better authenticate driver activities and trends in order to promote safer driving habits and more effective customer service. With constant visibility of fleet assets we are better able to identify equipment and driver trends as well as inclement weather and other regional hazards. Stability Control DevicesIn cab technology that provides drive assistance and stability control to reduce the number of incidents where a stability event could trigger an accident. All events are reviewed by a dedicated team of safety individuals with driver habits being evaluated through scorecard systems. Critical Event ReportingElectronic delivery of critical drive events with real-time notification. Drivers with events are consulted and if necessary provided with additional training to help ensure our fleet operates in a safe manner. Event reporting and trending gives us good visibility into our fleet at a high level. Comprehensive Log AuditingBy performing extensive in house log auditing we are able to ensure compliance with corporate, DOT and Federal mandates that make us a safe carrier. Employing Electronic Hours of Service nationwide gives us a safety and planning advantage over our competitors. Comprehensive Incident Review and TrainingExtensive post incident reviews are conducted with any employee involved in an incident. Additional follow-up training and/or process change is provided to reduce future risk. Continual job training gives our drivers the advantage of keeping their skills current with changing regulation. Recognition of Safe DrivingSafe drivers make for safe roads. At FirstFleet we believe in rewarding those on our team that excel in helping us meet our safety objectives. We are proud of our industry leading one million, two million and even three million mile safe drivers. At FirstFleet we believe in being a good steward of the natural resources we have been entrusted with, and we are always looking for ways to operate our fleet with as little impact on the environment as possible. As a SmartWay partner FirstFleet, Inc. is committed to making choices that honor the responsibility we have to future generations to seek ways to reduce the environmental impact that transportation-related emissions have on our planet. Late Model EquipmentBy operating late model equipment we are able to take advantage of increased fuel efficiencies as well as reduction in emissions. Each passing year brings new compliance objectives and stricter standards. We have found that by operating late model equipment we are able to better service our partners through a reduction in road service needs and increased efficiency. Efficiency Incentive ProgramA compelling incentive program to encourage our drivers to partner with us in the initiative to reduce fuel consumption and emissions by implementing better driving habits. We support this strategy by providing transparent access into fuel economy data to all employees. Auxiliary Power Unit & Bunk Climate ControlThe use of APU and bunk climate control devices greatly reduces the need for engine idle while ensuring the safety and comfort of our drivers. The end result of this investment is a happy & rested driver all while reducing related emissions. Local Impact InitiativesWe are actively engaged in managing our local impact on the environment through recycling programs, proper disposal of core parts and the use of waste oil heaters. Continuous Process RefinementWe are always looking for cutting edge ways to increase efficiency and reduce environmental impact. We are testing super single tires, low drag trailers, adjusting equipment specifications, fuel additives, nitrogen filled tires and a host of other options to become more efficient. Back Office EfficiencyThrough the use of electronic document archival tools we are reducing paper waste. Data center virtualization enables us to significantly reduce power consumption and cooling requirements.